Vibhishana(IAST: Vibhīṣaṇa or Bibhishan) was a king of Lanka in the legendary epic Ramayana. He was younger brother of the Rakshasa(demon) king Ravana of Lanka. Though a Rakshasa himself, Vibhishana was of a noble character and advised Ravana, who kidnapped and abducted Sita, to return her to her husband Rama in an orderly fashion and promptly. When his brother did not listen to his advice, Vibhishana joined Rama's army. Later, when Rama defeated Ravana, Rama crowned Vibhishana as the king of Lanka. In some period of history Sinhala people have considered Vibhishana as one of the Four Heavenly Kings(satara varam deviyo). This belief was more prominent in the Kotte period. According to the Ravana Katha of Wickramasinghe Adigar, after the defeat of Ravana, Vibhishana transferred the Yaksha capital from Alakamandawa to Kelaniya. In the 15th century poem of Thotagamuwe Sri Rahula Thera, the sælalihini sandesaya, Myna is ordered to carry the missive to Vibhishana at his temple in Kelaniya. After the 16th century, he was replaced as a God of the four warrants by the goddess Pattini. He continues to be worshipped by a diminishing number of adherents, mainly in the Kelaniya area. Vibhishana had a sattvic(pure) mind and a sattvic heart. From his early childhood, he spent all his time meditating on the name of the Lord. Eventually, Brahma appeared and offered him any boon he wanted. Vibhishana, said that the only thing he wanted was to have his mind fixed at the feet of the Lord as pure as lotus leaves(charan kamal). He prayed that he should be given the strength by which he would always be at the feet of the Lord and that he would receive the darshan(holy sight) of Lord Vishnu. This prayer was fulfilled and he was able to give up all his wealth and family, and join Rama, who was Avatar(God incarnate). Vibhishana was youngest son of Kaikesi and Sage Vishrava, who was son of Sage Pulatsya, one of the Heavenly Guardians. He(Vibhishana) was younger brother of the Lord of Lanka, Ravana and King of Sleep, Kumbakarna. Even though he was born in the demon race, he was alert and pious and considered himself a Brahmin, since his father was intuitively such. Due to Vibhishana's differences with Ravana because he was against the act of kidnapping Sita and most of all because Ravana wanted the throne for himself, he fled Lanka. His mother, Kaikesi, advised him to go and serve Shri Rama, who was at that time assembling an army to conquer Ravana and to recover Sita. He divulged the secrets of Ravana's army and made sure Rama ended up being victorious in the great battle. Lord Rama accepted Vibhishana's service and anointed him the Lord of Lanka after Ravana's death. In the Lanka War, Vibhishana's knowledge about the secrets of Lanka proved invaluable to Shri Rama. Vibhishana freely divulged many secrets that became key to the success of Rama's attack, including revealing the secret path to the temple of Mata Nikumbala, the family deity of the Pulatsya Clan. In the climatic battle between Rama and Ravana, when Rama was unable to kill Ravana, he revealed the secret of Ravana's death to Rama. 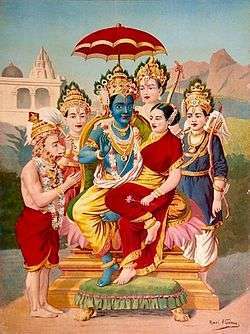 He told Rama that Ravana has stored tge nectar of immorality in his belly and it is necessary to dry it. Rama then finally killed Ravana. Because of this, however, Vibhishana is also known as a traitor. While modern readers tend to view the Indian epics with eyes used to seeing clearly defined good and bad characters, Ramayana's characterisation is trying to represent the practical implications of the concept of Dharma. 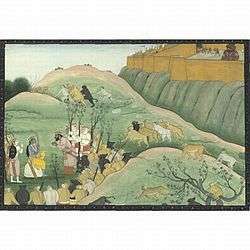 The epic stresses that neither Vibhishana or Kumbhakarna strayed from the path of Dharma and that there is no single way out of a moral dilemma. Ramayana teaches that Kumbhakarna adhered to the Dharma of loyalty to his kin when his advice fails, while Vibhishana chose to oppose his kin when his advice failed. Symbolically, Vibhishana represents devotion to Shri Rama and as a demon devotee, he shows that the Lord does not distinguish between his followers based on birth or circumstances in life. The same aught can be read in the story of Prahlada and Narasimha. When Vibhishana attained the position of the King of Lanka, he turned his subjects from the path of evil to the path of Dharma(righteousness). His wife, Queen Sarama also aided him in this effort. He had a daughter named Trijata. When Rama was about to leave Ayodhya at the end of his reign, Lord Rama in his original form of Shri Vishnu ordered Vibhishana to stay on earth and serve the people and guide them to the path of truth and Dharma. Hence, Vibhishana is considered one of the seven immortals or Chiranjeevins. Lord Vishnu also ordered Vibhishana to pray the family deity of Rama's natal Sun Dynasty, Lord Ranganatha. Vibishana is attached with the legend of Srirangam Ranganathaswamy temple, considered the abode of Vishnu on earth and the primary temple of Vishnu on earth. During the coronation of Rama, avatar of Vishnu, Vibishana was presented the sacrosanct Sri Ranga Vimana. He was carrying it all the way to his kingdom of Sri Lanka and midway, to rest, he placed the image on the banks of Kaveri. After performing his routine pooja, he tried to lift the Vimana, but it could not be lifted. Mahavishnu appeared to him and said that he desired to stay as Ranganatha in the place, which went on to become Srirangam. 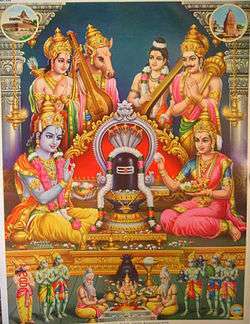 Vishnu also desired to watch the Brahmotsavam at Tirucherai. The festivals of the temple are thus considered sacred. ↑ Kariyawasam, A.G.S. "The Gods & Deity Worship in Sri Lanka". The Wheel Publication No. 402/404, ISBN 955-24-0126-7, Buddhist Publication Society. Retrieved 26 September 2014. ↑ M., Rajagopalan (1993). 15 Vaishnava Temples of Tamil Nadu. Chennai, India: Govindaswamy Printers. pp. 66–75.